Island Forest - This plan has it all; 2 suites on main, 2 bedrooms plus media up, wonderful access to large deck overlooking the lake off the media room, mud/laundry room on main, dog washing station w/ hot and cold water in garage , central Vacuum, huge tile roll in shower with 3 heads, built-in office furniture, so much natural light and open floor plan, dual fuel stove/ovens and high end Stainless Steel appliances, walk out attic, all new carpet, real wood floors just refinished, all new paint, very new hot tub overlooking the lake -off the master, quiet neighborhood off of Bethel Church Rd, bike ride to grocery store, restaurants and shops, neighborhood has private boat ramp and lake access lot. MLS#3493876. Southern Homes of the Carolinas. 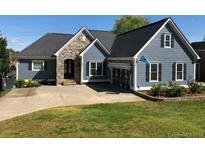 Poplar Grove - Multi-generational with 2nd living quarters. Excellent condition. MLS#3498516. FK and Associates Real Estate Firm. Harbor Cove - Very convenient location ... close to shops, restaurants, highways, hospital. MLS#3494723. EXP REALTY LLC. Wellesley - Don't miss your chance to own this delightful home! MLS#3492822. Ivester Jackson Properties.